The land that Polly’s sits on was settled in the early 1800’s by Brigham Hildreth. He ran it as Hildreth Farm and also ran his cobbling shop on the property. His son, Chester, took over the farm and had a daughter Lucy, with his wife Jennie. Lucy married Wilfred “Sugar Bill” Dexter and the farm was renamed to combine their two last names (Hildreth and Dexter): Hildex Farm. Wilfred turned maple into one of the main crops of the farm and began to ship maple products all over the country. Lucy passed away and Wilfred remarried Pauline “Polly” Taylor. In 1938, during the great depression, they devised a way to highlight their maple products by opening up a tearoom and serving pancakes! 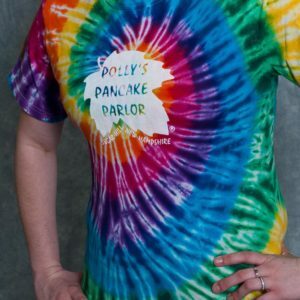 “Polly’s Pancake Parlor” was born. Wilfred and Polly had a daughter Nancy. Polly and Will’s daughter married Roger Aldrich in 1949 and in that year took over the management of “Polly’s Pancake Parlor. 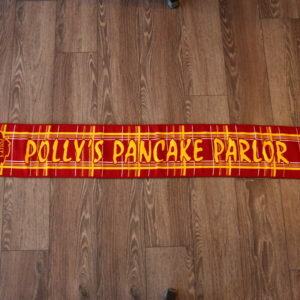 They expanded the menu, the season and Polly’s began to reach the entire nation! Wilfred Dexter passed away in 1960 and in 1964 Polly followed him. 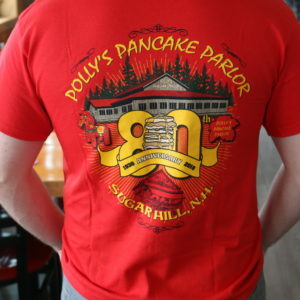 Polly’s, under Nancy’s watch, expanded its selection of pancake flavors, and made them available to purchase and make in your own home. Nancy’s daughter Kathie then took over for her in the 1980’s. Kathie and her husband Dennis Cote continue to run Polly’s today! Polly’s still grinds its flour here and still produces the maple sugar and maple spread you can see on the maple tray at your table. In 2014 the small tearoom, which had been expanded upon several times, was falling into disrepair and could no longer support the volume of customers that visit Polly’s each year. Kathie and Dennis made the difficult decision to rebuild. 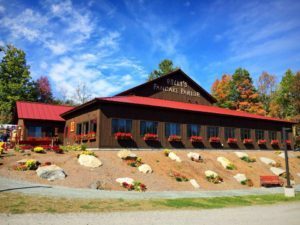 Now Polly’s is open year round and can serve even more folks! Some of the barn boards on the walls were salvaged from the original building and is adorned with antiques that have all been used on the farm. The antique tools and other items displayed here are mostly family relics found in the attic and sheds here on the farm. Some have come from relatives and a few have been purchased. Our home and farm has been continuously occupied by the same family (through marriage) since it was originally settled in the 1800’s. 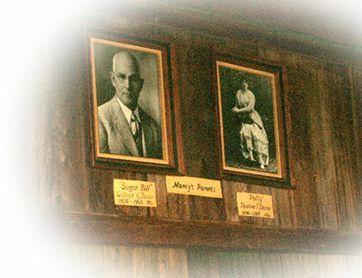 Some of the ancestors portraits are hanging on the walls in the pancake parlor. There are Civil War relics along with the old tools. None of the antique articles displayed are for sale, but you’re sure to find them interesting. The original menu has been greatly enlarged to include Buckwheat, Cornmeal, Oatmeal Buttermilk, Gingerbread and Whole Wheat pancakes and waffles which are varied by combining them with blueberries, walnuts,coconut, or chocolate chips, along daily pancake specials such as carrot cake or lemon poppyseed! We serve country style patty sausage and smoked bacon and smoked ham made by our friends at North Country Smokehouse here in New Hampshire. Sandwiches made with our own homemade bread (white, whole wheat, dark rye, sourdough, cinnamon raisin or oatmeal) are available. We also serve English muffins, quiche, soups, and other items as specials, ALL HOMEMADE here! We use no prepared mixes. Our pancake batters are prepared from the original recipes from the flour on up. We use the best ingredients obtainable in an effort to serve the lightest, fluffiest pancakes possible. Our whole Wheat, Buckwheat, Oatmeal Buttermilk and Cornmeal Pancakes and Breads are made with organically grown grains, which we stone-grind ourselves on the premises. The Whole Wheat is high protein, hard spring wheat. For dessert we serve choice fresh fruits in season, plus homemade pies, apple crisp, and other baked goods. We serve fresh eggs, any style, and the best coffee you ever had, made with our pure fresh mountain water. 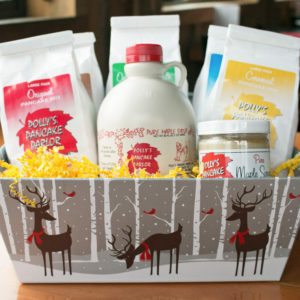 Our syrup is personally selected for color and flavor from our friends at Fuller’s Maple in Lancaster. The granulated maple sugar and maple spread which is served with our pancakes and waffles is homemade by us here at the farm using the same process as “Sugar Bill” Dexter. These products are consumed by the hundreds of pounds at the “Pancake Parlor” and many people take some home with them for their own use or as gifts for friends. We also sell by mail order, as we have for over 100 years! Among our guests we have a high percentage of repeat customers, who, over the years, have become our very good friends. We hope to list you among them.